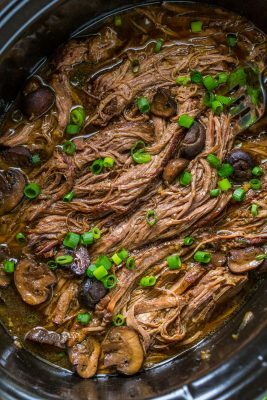 This slow cooker beef brisket is fall-apart tender, so juicy and flavorful and you won’t believe how simple the ingredient list is! 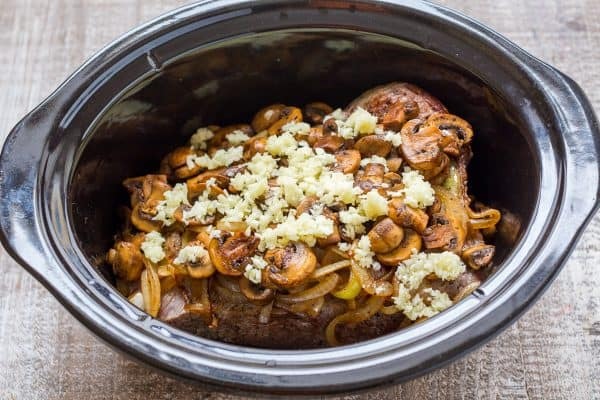 This slow cooker brisket had everyone’s seal of approval – rave reviews every time! 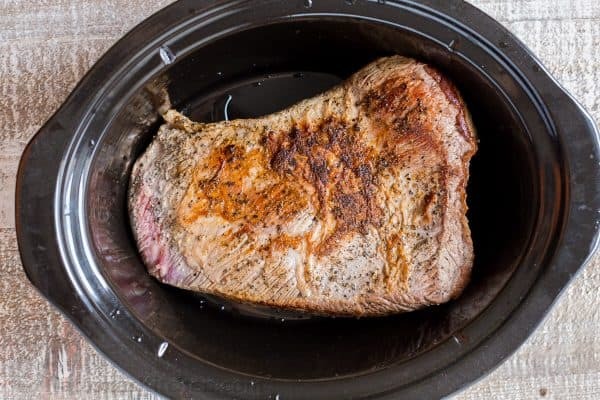 Crockpot beef brisket is great as a side dish with mashed potatoes or served as beef brisket sandwiches. 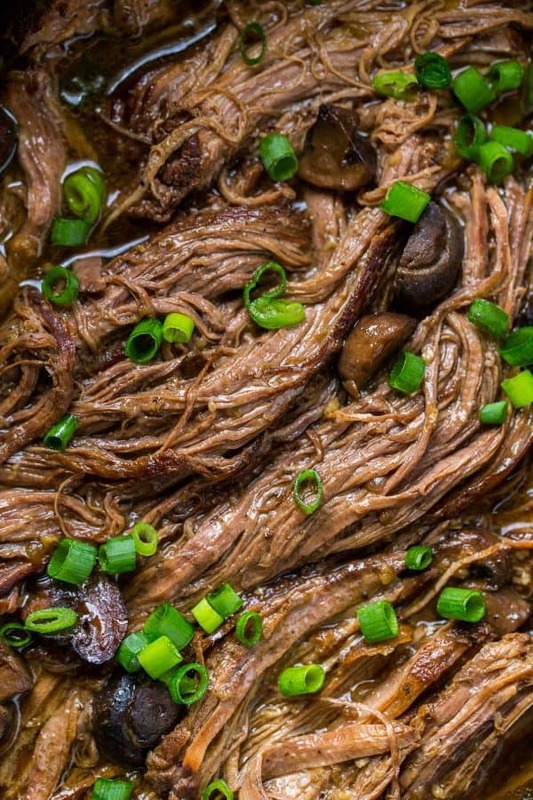 The slow cooked mushrooms are just as delicious as the slow cooked brisket. You will savor every bite. 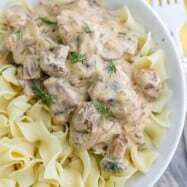 This one is also awesome for meal planning because leftovers refrigerate REALLY WELL! And it’s about time we share more SLOW COOKER recipes!! We love easy, juicy, melt-in-your mouth meat and it is my favorite way to use our slow cooker. 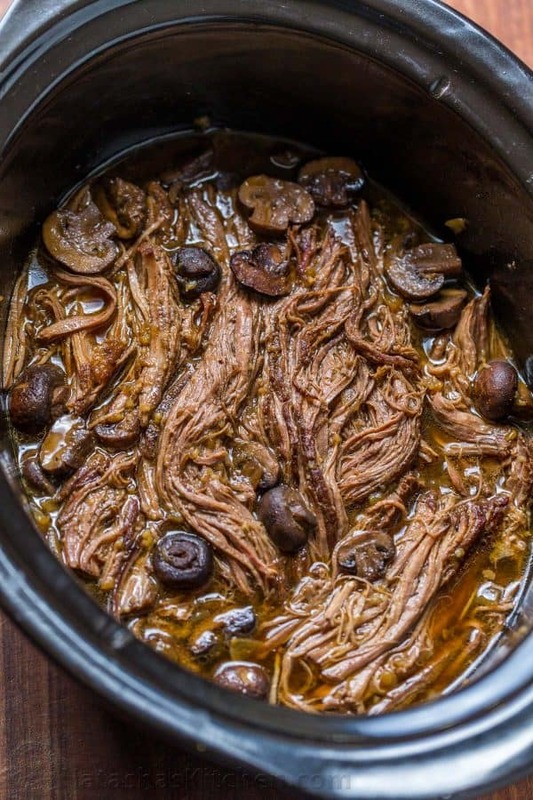 This Beef Brisket slow cooker recipe is adapted from theKitchn. Recipe updated 10/10/17 garlic amount reduced from 8 cloves to 6 to account for varying sizes of garlic cloves. Use 6 medium garlic cloves and be sure to chop the garlic (do not press garlic for this slow cooker recipe). *Garlic Tip: it is easiest to mince this quantity of garlic in a food processor. Do not use a garlic press for this recipe. 1. Generously season brisket with about 2 tsp salt and 1 tsp black pepper. Heat a large heavy skillet or cast iron pan over high heat. Add 1 Tbsp olive oil and when hot, add brisket (fat side down). Sear 4-5 minutes per side or until browned on both sides. Transfer to slow cooker with the fat side facing up. 2. In the same pan, add 1 Tbsp olive oil and sliced onions. Sautee 5-7 minutes or until onions are caramelized. 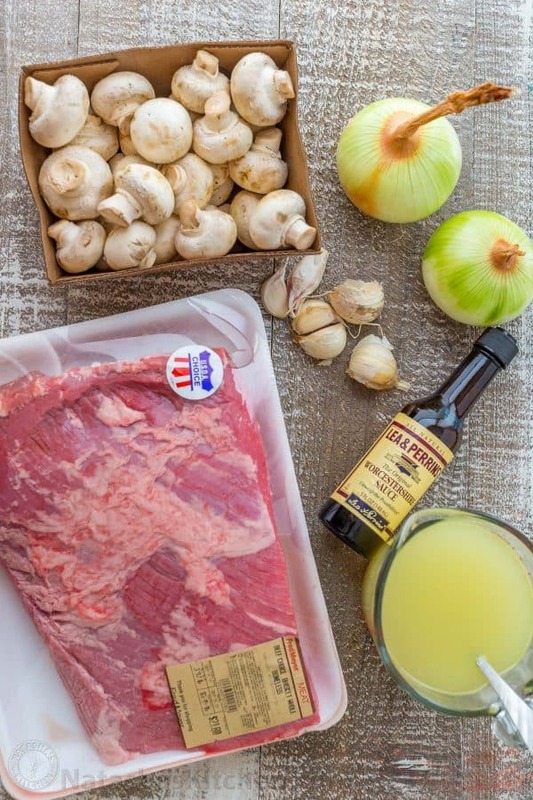 Place onions over brisket. In the same pan, add more oil as needed and saute mushrooms until softened (5 min). 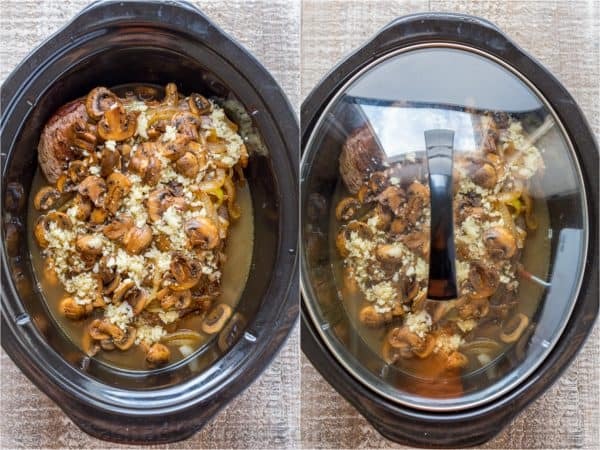 Place mushrooms into the slow cooker. Sprinkle chopped garlic over the mushrooms. 3. Combine 2 cups chicken broth with 2 1/2 Tbsp Worcestershire sauce and pour mixture over the meat. 4. Cover and cook on low 7 to 8 hours or until cooked through and easy to pull apart with forks. Turn off slow cooker and rest for 15 minutes with the lid on. 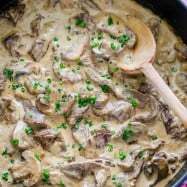 Remove and discard excess fat from the top** then pull the beef apart with forks and keep it in the slow cooker to soak up the juices which will add incredible flavor and keep the meat tender. 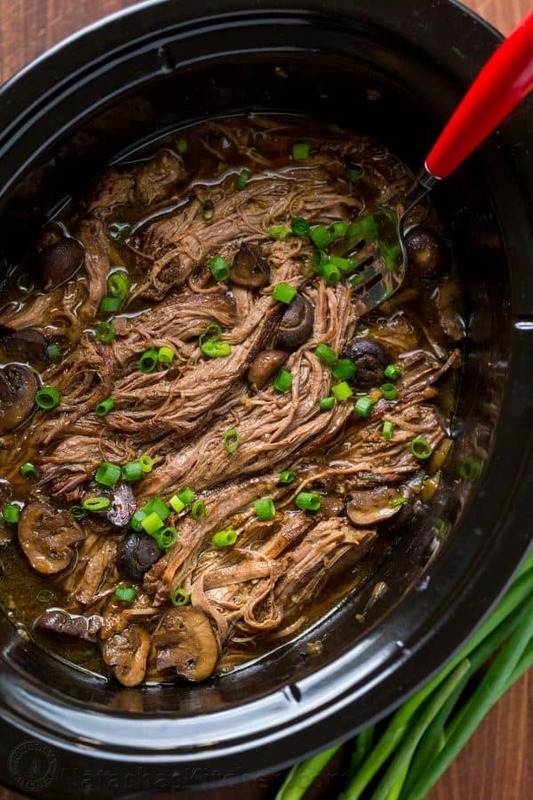 Serve beef brisket and mushrooms, spooning the slow cooker brisket juices over the top. **Picky Eaters Tip – I prefer my meat to be really clean and lean so I transfer the meat to a platter to make sure I have removed all of the fat, then return the shredded meat to the slow cooker. 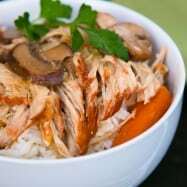 This will thicken up when refrigerated but turns back into a beautiful broth when it is reheated ands YES, Leftovers keep super well in the refrigerator and can be warmed on a skillet or microwave, or the oven. This slow cooker beef brisket is fall-apart tender, so juicy and flavorful. Slow Cooked beef brisket is easy and gets rave reviews every time! Perfect with mashed potatoes or as beef brisket sandwiches. Generously season brisket with about 2 tsp salt and 1 tsp black pepper. Heat large heavy skillet or cast iron pan over high heat. Add 1 Tbsp oil and when hot, add brisket (fat side down). Sear 4-5 min per side or until browned on both sides. Transfer to slow cooker, fat side facing up. In the same pan, add 1 Tbsp oil and sliced onions. Sautee 5-7 min or until onions are caramelized. Place onions over brisket. In the same pan, add more oil as needed and saute mushrooms until soft (5 min). 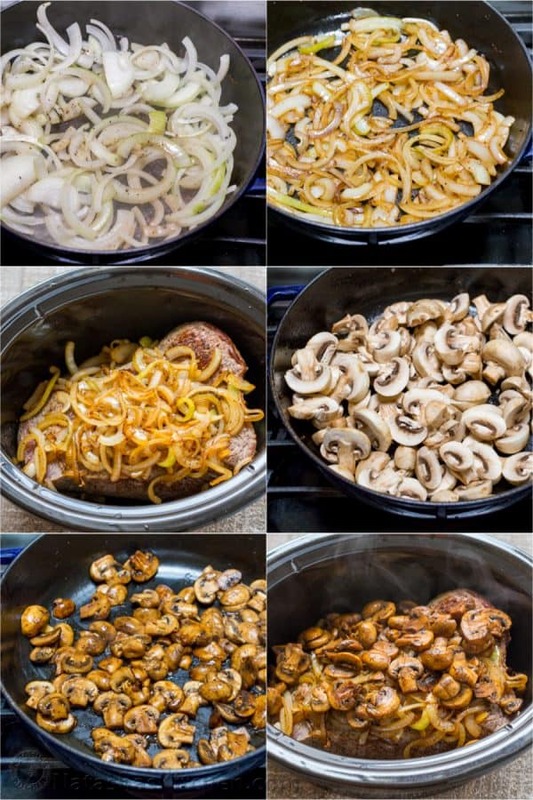 Place mushrooms into the slow cooker and sprinkle chopped garlic over the top. 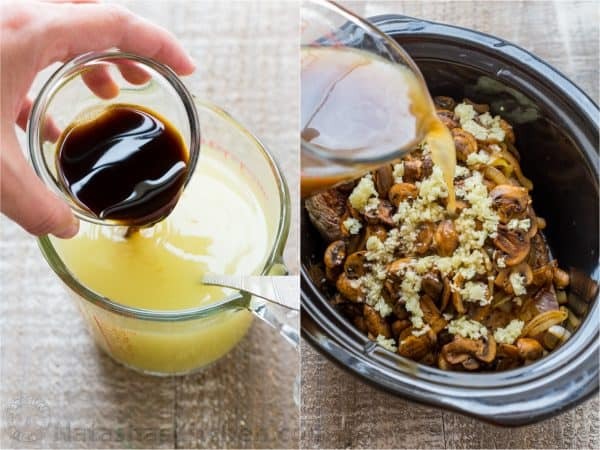 Combine 2 cups chicken broth with 2 1/2 Tbsp Worcestershire sauce and pour mixture over meat. Cover and cook on low 7 to 8 hrs or until cooked through and easy to pull apart with forks. Turn off slow cooker and rest 15 min with the lid on. 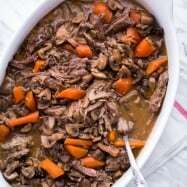 Remove and discard excess fat from the top** then pull the beef apart with forks and keep it in the slow cooker to soak up the juices which will add amazing flavor and keep meat tender. 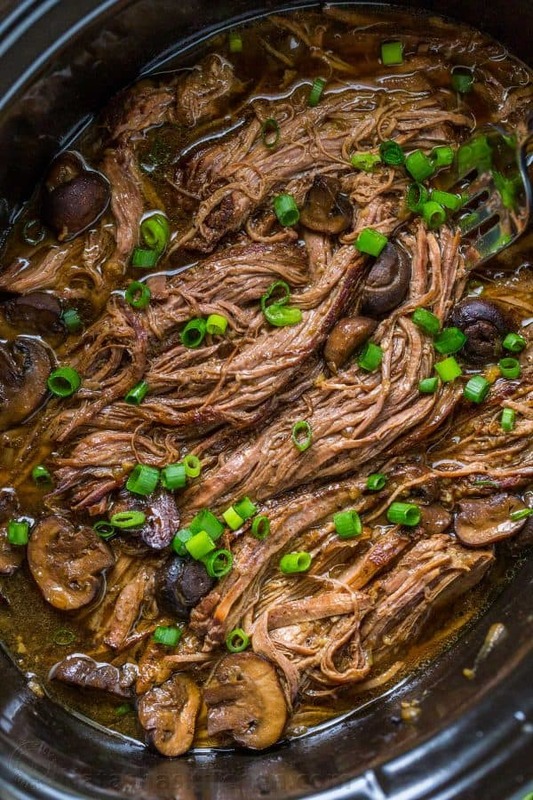 Serve beef brisket and mushrooms, spooning slow cooker juices over the top. 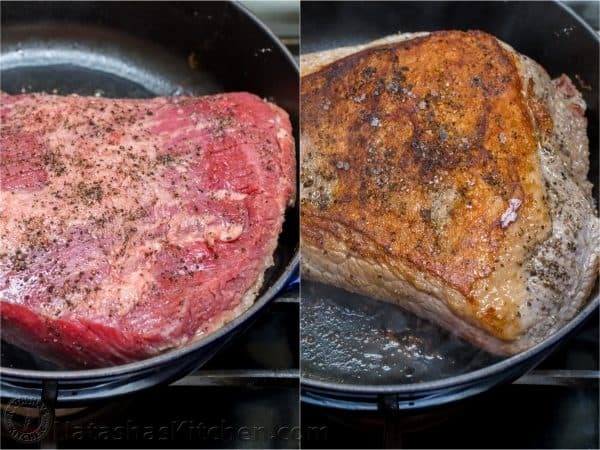 **If you prefer really clean and lean meat; transfer the meat to a platter to make sure all of the fat is removed then return the shredded meat to the slow cooker. Note on Nutrition: the nutrition label will vary greatly based on how much you trim the fat from your meat. Also, keep in mind some of the salt and liquid may get discarded at the bottom of the pot. Garnish with chopped chives or green onion to fancy it up. Garnish adds a beautiful pop of color and fresh flavor to everything. It is the easiest way to make your dish more beautiful for a dinner party. I hope you fall in love with this brisket recipe slow cooker style! It’s so juicy and flavorful. I look at that photo and want it all over again! 😉 Enjoy this my friends! P.S. 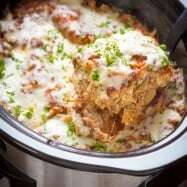 Crazy for crockpot recipes? If you loved this crockpot brisket, don’t miss our most popular slow cooker lasagna! Hi! I love the recipes on your site! Tried this last night – so simple, yet sooooo good. Hi Natasha your so right! I don’t think I need to double the recipe. Last question, do you think this recipe would work with a different kind of cut? I currently have on hand Beef lion tri tip roast. what is lion tri tip? lol Randy. I think you’re right about that. Wow, I cooked the slow roast brisket in my slow cooker today, (following your instructions). It was delicious! Natasha, I don’t own a slow cooker. Can you give me cooking instructions for the brisket and beef stew, oven temp? and time? How can anyone be surprised that their mouth was smelly after using so much garlic.. I love your recipes! 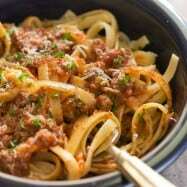 Do you have any pressure cooker recipes?